Do you understand your responsibilities when organising Sustainable Neighbourhood activities? Learn how to manage risks and protect the health and safety of volunteers and participants in your activities. "This training gave me confidence and reassurance about organising our events safely and effectively," previous participant. At least one representative from each Sustainable Neighbourhood group should attend this important training session to ensure your activities can be covered by insurance. 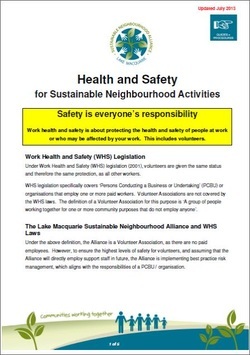 This document outlines some of the Health and Safety requirements for Sustainable Neighbourhood activities.